Respond to their legitimate call! People of Ahvaz. 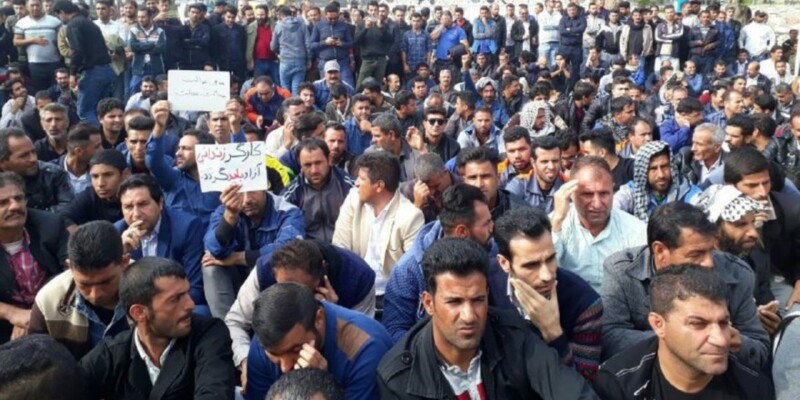 For over three weeks now, you have followed the solid and united protest of the steelworkers on the streets of Ahvaz against poverty, oppression and injustice. You've heard their vibrant chants against the thieves and the parasites. Undoubtedly, all of you who are fed up with the current misery have heard the encouraging and enthusiastic words of the steelworkers’ leaders. This fight is over unpaid wages, restart of the production lines and elimination of the threat of job losses that looms over 4000 workers and their families; this is a fight in defence of workers of Haft Tapeh and for the release of the detained workers; this is a fight against poverty, high prices, oppression and lack of rights. This fight has paved the battleground for all of you, for teachers, for retirees, for unemployed youth, for women and for all of you who are tried of the current situation in Iran. Surely you do know that and stand by the workers, as you've been doing by attending their protests; but you can play a much bigger role in this struggle. Leaders of the workers ask for your support and to take action. We, too, along with the leaders of the steel workers, call on teachers, petrochemical workers, university students, youth, women and all the oppressed people to actively, in any way you can, support the steel workers. Support the workers and strengthen their ranks against a bunch of parasites. Join the steel workers and their families and fight for the release of the imprisoned workers of Haft Tapeh, while voicing your own legitimate demands. There are many more strikes that are going on in Ahvaz right now; all the strikes should be synchronised and a united strike organised across the whole city. The city of Ahvaz must stand up as one body and show undivided solidarity with the striking workers to push back the oppressors. The power of the parasites and their repressive forces is shrinking day by day, and you have the power to put them in their place, and, thus, just like the steelworkers and sugar cane workers, set an example of unity and solidarity for the whole society. The very next time I read a blog, I hope that it does not disappoint me as much as this particular one.new year messages to friends I mean, I know it was my choice to read, but I truly thought you would probably have something useful to say. All I hear is a bunch of crying about something that you could possibly fix if you were not too busy searching for attention.